Georgia is my first male monarch butterfly that I have raised from an egg. It has been a rewarding, yet arduous process. He wasn’t doing very well and wasn’t thriving. He would lie on his side and not do anything. I turned my guest bathroom into Georgia’s spa. I warmed the room with a small heater, cut up fresh orange slices, and made some honey water for him to feed on. He got much stronger, and I released him two days later due to all the rain from hurricane Florence. He was tagged with a special tag from Monarch Watch. This tiny tag can be used to track their migration to Mexico. 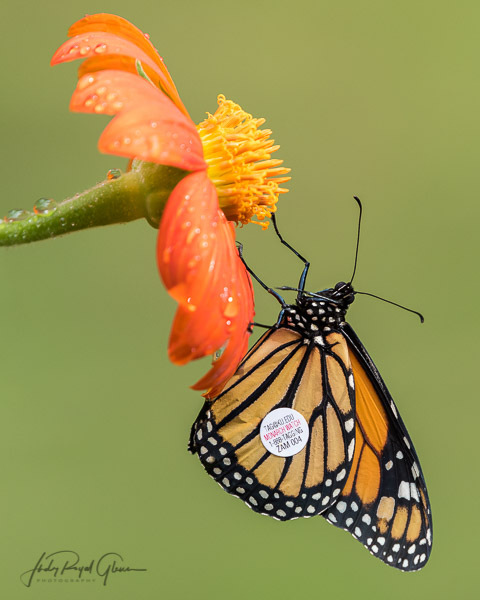 If found, the tag should be reported through the Monarch Watch website. I now have an inkling of an idea of how it feels to have lived in the depression. Milkweed, their source of food, was a rare commodity. I purchased one milkweed plant in the spring and a female monarch laid a billion eggs on it. I had to drive out-of-town to buy more because none could be found in Athens. Those four plants I bought also had a billion eggs! This cyclical cycle played out over and over again leading me back to buy six more plants. There were times that I did not know if I would have enough to feed my babies. 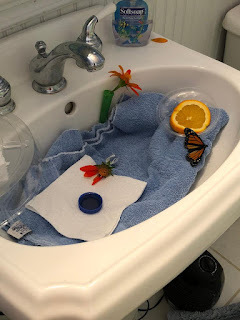 I adopted three caterpillars to a friend and helped feed her monarchs from my plants knowing I may not have enough. Scraps of leaf bits fell into the pots, and I would scrounge up what I could to put in the center of the caterpillar cage to create a smorgasbord of food. Another friend helped by giving me some of her milkweed, and she knew where I could adopt out some of my caterpillars. In total, I adopted out 26 caterpillars. My friend that I adopted three caterpillars to knew someone which led to her bringing me two young milkweed plants. I now know I will have enough. The Lord provided milkweed right when I needed it! Note how he has his head turned to look at me. I have never seen a butterfly do that!